Time to come clean. For someone who travels this country fairly extensively, I really have no idea where I’ve been. My local geography is truly woeful. When I’m not battling in my head whether it’s a left turn here, no right, or maybe straight through?, I’m getting my New Plymouths and my Palmerston North’s in a jumble – it’s all very embarrassing. Luckily then, technology has come to my rescue and with the advancement of GPS technology I at least now know where I’m heading. After sampling many of the key portable units on the market, I – quite literally – would be lost without one. This latest flagship MY500XT model from the New Zealand founded NAVMAN brand has become my new favourite. It passes my own completely unscientific testing procedure for such products in the past in that the accompanying manuals are no thicker than the unit itself, which would surely deem it far too complicated, and thankfully, I didn’t even need to delve into the instruction booklet once. Partially as I’m growing familiar with GPS units, but more so that it’s very intuitive to use and perhaps the truest testament to this is it making this once devout TomTom (Navman’s key competitor) fan a convert. Key to the new Navman’s attraction is, first and foremost the brilliant new touch-screen interface. The MY500XT benefit heavily from the trail blazed by Apple’s brilliant i-Phone, sharing a very similar menu system and scrolling through street names is achieved by the effortless flick of the finger, now synonymous with the Apple product. The screen isn’t as sensitive to the touch as I would’ve liked but the each of navigation throughout the features more than makes up for it. If you’ve never used a GPS navigation system before, the MY500XT is a good place to start. The display is beautifully crisp and the new advanced lane guidance shows rich, unmistakable diagrams of what motorway exit you need to take. Also included is new Traffic Live technology that will alert you about reported snarl ups and road works that might hinder your progress. It can even report the weather which is all a bit snazzy. All the must have features are there too: a GPS co-ordinate capturing button so you can find that secret spot next year, an FM Transmitter to connect to your car stereo, shortcut Buttons to Petrol, Parking, Food and Emergency Services and a Bluetooth phone connection. Things I’d change if I could? The power connection makes it difficult to plug in without removing the unit from the screen. A frustration definitely, but not one that stops me from wanting one of the $594 units. 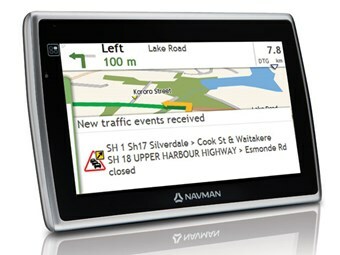 Check them out at www.navman.co.nz or electronic stockists now.